It's the end, sad to say. "Farscape" airs its final original episode tomorrow night at 8 on Sci Fi, the cable channel that last fall announced it was terminating its commitment to a fifth and final season by cutting funds to the critically acclaimed show after its already- filmed fourth. But this month also marks a beginning for one of TV's best dramas - not just best sci-fi, but best drama, period. Those of us obsessed with "Farscape," and those who've yet to discover its depth, can now live the thrills right from the amazing pilot hour as Sci Fi starts repeating the entire series, Monday night March 31 at midnight. All 88 episodes then air Sunday through Thursday nights at midnight. And that may be the real start for Farscape the Phenomenon. Look at the most obvious TV model. "Star Trek" didn't really live until it was dead. Cancellation was what turned space- the-final-frontier into an eternal oeuvre. The weekly tale needed daily delivery to build its fan base, through constant immersion and the chance to absorb episodes repeatedly. It wasn't until we were all parroting "Beam me up, Scotty" that "Trek" truly found its way into pop culture afterlife. "Farscape" has even more going for it. The core story of lost American astronaut John Crichton takes place in our own time frame, name-checking Yoda and Steven Spielberg in the first episodes and referencing 1-800 numbers in tomorrow's finale. Crichton might be a space cowboy, but he's no love-'em-and-leave-'em chieftain Kirk. Rather than handily handling plot devices, actor Ben Browder gets plunged into a loosey-goosey cauldron of alien appetites. He moves through full- bodied humor, rage and desire as his adventures unfold in stunningly theatrical production values. And they evolve on a continuing basis, forming over weeks and even months, which enables the show's striking dramatic substance (and also, unfortunately, makes plots hard to pick up in progress). But series creator Rockne S. O'Bannon's great masterstroke was designing a behavioral dynamic that raises the emotional stakes to extremes. Crichton is utterly alone in space. So are the ragtag cohorts with whom he falls in on the living ship Moya - escaped prisoners or renegades in their own worlds, each searching for something, living without rules but with their own individual senses of morality, which may or may not dovetail with anyone else's. With the aliens on equal footing with the human, their characters vibrantly manifest their own aspirations and agendas. They're often at cross-purposes. They act on passions and prejudices, which makes for intense entertainment. Even the animatronic characters from the Jim Henson Creature Shop can be astonishingly expressive. It's that nervous edge - and contemporary irreverence - that drew "Farscape" a more broad-based audience than most sci-fi, most of it adult, much of it female, and decidedly non- geek. The richness of the storytelling radiates to the end, when Crichton and warrior Aeryn Sun (Claudia Black) reach a critical juncture in their relationship, when Crichton again faces that id/ego challenge of having the evil Scorpius (Wayne Pygram) implanted inside his head, when we're not sure who's betraying whom or whether Earth is going down for the count. Yes, there are spaceship battles. Yes, there are creepy aliens. But most of all, there's a humanity that's heart-rending. Crichton is lost in oh-so-many ways. And just when it looks tomorrow like he might be found - well, you'll have to see for yourself. And you'll have to wonder what might have been. 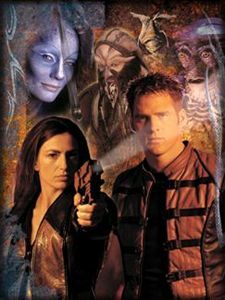 Browder and Black are back looking for work stateside ("Farscape" filmed in Sydney), and all parties to the production have moved on. Fans mounted an impressive campaign to revive enough interest to continue (www.savefarscape .com), but the series seems sincerely dead. Oh, well. Maybe 30 years from now, we'll all be whining about how limp the ninth "Farscape" movie and fifth TV spinoff are, and how long-in-the-tooth old Browder is getting. If only.